A pro-Biafran leader on trial for treason in Nigeria on Saturday said he was in Britain, after skipping bail, disappearing for more than a year and re-emerging in Israel. The former London estate agent was seen standing in the dark outside Leeds Bradford Airport in northern England, wearing a winter overcoat and jumper. The photograph was undated but is understood to have been taken in the last few days. The same Twitter account — @MaziNnamdiKanu — has been used since he announced his re-emergence in Israel in October last year. Britain’s foreign ministry said in a statement: “We provided assistance to a British man in Israel. 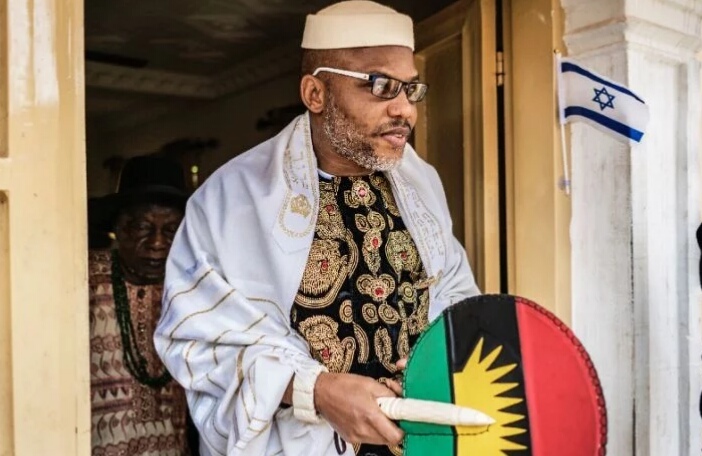 Kanu, who also runs the outlawed Radio Biafra, believes the Igbo people who dominate southeast Nigeria are a lost tribe of Israel and Biafra is the promised land. He had not been seen since a military operation against IPOB and its supporters in his home city of Umuahia in September 2017, sparking speculation as to his whereabouts. Kanu, who is in his 40s, was arrested when he arrived in Nigeria from Britain in late 2015 after calling for a separate state of Biafra. His arrest and detention sparked mass protests and clashes with the security services. He was eventually released on bail. He had to surrender his British and Nigerian passports as a condition of his release pending his trial in the capital Abuja, indicating he may have obtained emergency travel documents to get to Britain. The pro-Biafra agitation is one of a number of security challenges facing President Muhammadu Buhari as he seeks re-election at polls on February 16 next year. A previous unilateral declaration of a republic of Biafra by Igbo separatists in 1967 sparked a brutal 30-month civil war that left more than one million dead. Kanu has called for his supporters to boycott the vote, as part of a wider policy of non-cooperation until there is a referendum on sovereignty. But the vote will be closely watched, as Buhari’s main challenger, Atiku Abubakar, of the Peoples Democratic Party, has chosen a former southeast governor, Peter Obi, who is Igbo, as his running mate.